I awake at 5:00 a.m. to the sound distant fireworks and the neighbor’s barking dogs, after eight mostly-uninterrupted hours of replenishing sleep. We loll around a bit, then sit in our sunny courtyard drinking tea as Jack breakfasts on amaranth cookies and oaxaca, the Mexican string cheese, from the corner Oxo store – a sort of south of the border 7-11. At 11:00, as the temperature climbs to 90˚, we head out for Centro, the downtown district. We’ve been invited to noon brunch by former Minnesota residents we connected with through a mutual acquaintance back home. A chance to ask all the questions I’ve been jotting down over the past few months and get a feel for what they love about this place. This should be a 20 minute brisk walk, but steep pathways make it tough on Jack’s unaccustomed legs. With frequent rest stops as I march ahead to scout things out, we finally reach the main town square 45 minutes later. Here, the streets are often not labeled; the residences and shops are often not numbered. We ask four different people for help and get four different sets of directions, eventually wandering onto the right block of conjoined structures. At 12:03, we knock on what we deduce must be the door we are looking for. Success! This is a home different from any I have ever entered. Darker than I expected, in spite of the multiple courtyards; smaller rooms than I expected, because of the multiple courtyards. More of that closed-off feeling that results from the outdoor areas being surrounded by house walls or solid fences. Our hostess serves a delicious ham and egg, cheese, and vegetable casserole, warm from the oven. And the fruit. Makes a person misty-eyed, senses awakened to the honeyed juices of uber-fresh, perfectly ripened local pineapple, cantaloupe, mango, raspberries. I pull out my list of questions, some already answered by the five American ex-pats assembled around the table with us: Medicare doesn’t work here, but health care is incredibly inexpensive; utility costs are high, but usage is very low; mail service is utterly unreliable and telephone service only slightly more dependable. And the deal-breaker question for me: Bullfighting. Repulsed by the thought of living in a country whose national pastime involves animal torture, but also knowing the flaws in my own culture, I might consider sequestering myself in an enclave that has rejected this inhumane practice. Does San Miguel have, as I had heard, a moratorium on bullfighting? No; they do not, our hostess explains with casual lack of concern. The arena is just at the edge of the city. My heart drops, thud, into the pit of my belly. Acid creeps over my tongue. I pop another cube of succulent cantaloupe into my mouth, but the bitter taste remains. And stray animals. We have seen several malnourished dogs wandering the streets already. Now our hostess introduces us to the two cats they rescued after someone had dumped a litter of kittens, in a bag, in the street. I may forfeit my lovely lunch right here and now. I know this stuff happens, to some extent, everywhere. But there are usually organized efforts to fight it; not so, it seems, in San Miguel de Allende. In spite of liberal sunscreen application, my neck is burned a sunset pink by the time we’ve made our way to daughter-in-law Esther’s house late afternoon, a stop on our way out to her brother’s ranch for a cookout this evening. Wrong shoes, meandering routes, blistered feet. Esther’s family compound, a multi-level series of flat-roofed, concrete buildings left to her and her siblings by her parents, begins curbside and extends five-or-six residences deep, one rectangle after another of grey slab walls, floors, ceilings. We sip cautiously at the tap water offered to us by her brother and his wife, meet numerous children, cousins, friends, and neighbors who move in and out of the area as we walk and talk, discussing possible improvements Esther plans to make to her place. Eventually, her brother’s pickup truck sputters up curbside to collect us – two in the forward cab; Jack and me, facing each other, in pop-up seats behind the driver; and six or seven people piled into the open bed of the truck. It’s okay, stepson Jason assures me. We do it all the time here. Still, I am closing my eyes. Nudge me when we get there. But this is too noisy and bumpy a ride to nap through, as the truck rattles and gasps its way, mostly empty milk and juice bottles discharging from under the seats like flipper-powered pinballs in an arcade game at every corner. A spider web windshield crack partially obscures the driver’s line of sight and a piece of transported furniture blocks our view of the truck bed behind us, but the crew in back is having a raucous good time. Closing my eyes again. The “ranch” is a cactus farm. Today the small concrete-walled, one-room main building holds a dozen females aged six to eighty-six. Smiling, laughing. Slapping out homemade tortillas in quick succession on a huge homemade metal cooking oval over a butane-fueled cook stove. No English here, but many handshakes and warm greetings. More laughter, as we try to mentally register all the new names and faces. Once we leave the building we do not see the “cooks” again. There is another small unattached concrete building housing a toilet, with a water spigot outside to accommodate hygiene. Esther’s brother leaves to go pick up a second load of attendees, but soon her cell phone rings. He has not made it back to his house before the truck breaks down. The second group will not be coming. Carne asada on the grill. Roasted nopales cactus leaves and giant spring onions. Warm homemade tortillas. Charred corn on the cob, fresh salsa, barbecued lamb. Semi-chilled beers from the cooler and many jokes about Jason’s acquired appreciation for tequila. Riding home, we wedge four people into the back seat of some Juan’s tiny 1998 Chrysler Concorde, and I work in some quality prayer time. Back at our rental, and wishing I had learned a bit of Spanish last month as I promised myself I would, I nod off over my book around 10:00, smiling over Esther’s carrying of toilet paper to the “ranch,” and her jests about the bathroom there being a tree, and the leaves, “our Charmin.” It is good to be with family, even if you don’t speak the same language. 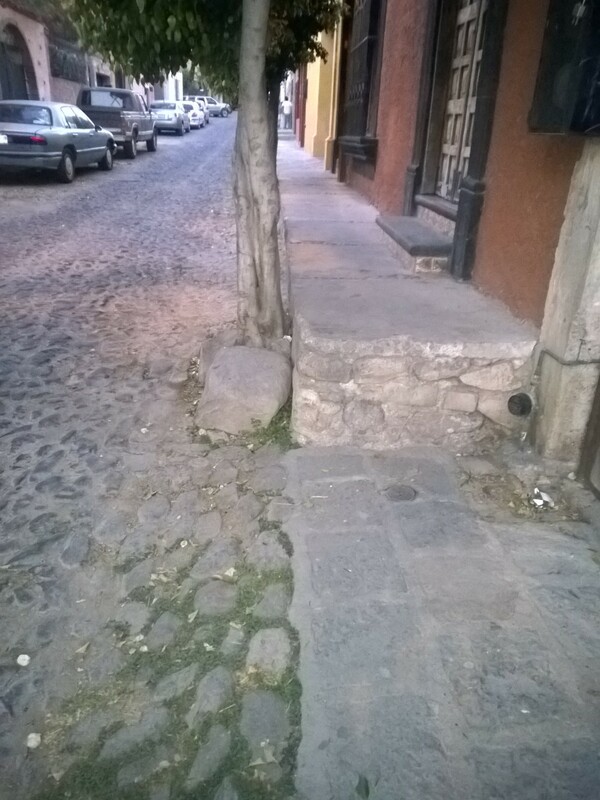 The challenging sidewalk outside our rental house. For over a year now, I’ve been enthusing to anyone who would stand still long enough that my husband and I were considering a move to Mexico. San Miguel de Allende in central Mexico, to be specific. A number of factors figured into this announcement. Our daughter-in-law grew up in that area, for one. She first extolled its virtues as a retirement destination during a Christmas visit in 2011, causing a wary twinge in my gut at the initial suggestion. But then we started trolling the internet. Over the next year we watched dozens of glowing YouTube videos – testimonials from transplanted ex-patriots; clips of Doc Severinsen and the San Miguel Five playing local clubs; an interview with singer/talk show host John Davidson about building a home in SMA; an Anglo professor reading his poetic ode to San Miguel, as the cameras capture romantic glimpses of the city’s historic cathedrals and quaint cobblestone streets; constant references to the vibrant arts and culture of the place. Having invested decades of active participation, we are also weary of Minnesota’s climate – both political and atmospheric. The weather in San Miguel is as perfect as it gets. Lows in the 50s at night. Highs in the mid-70s to mid-80s during the day. Virtually year-round, day after day. Boring to some, as one interviewee admitted, but sounding like heaven on earth to us after yet another brutal winter, 2,000 miles north of SMA in MSP. And my husband retired this spring, after several years of underemployment and a forced early sign-on to Social Security for me. Finances will be an issue for us. With San Miguel property taxes one-tenth of the Minnesota rate, heating and cooling expenses minimal, and the cost of fresh meat, seafood, eggs, and produce at the weekly outdoor market more than reasonable, it seemed sensible to take a serious look at the possibility of transplanting our household. So…two weeks after my husband’s last day of work, we climb on a plane, San Miguel bound, hoping to confirm that we have discovered the retirement haven of our dreams. My journal entries and general impressions follow. We are up past midnight with last minute preparations, sleep restlessly, and then the alarm sounds at 4:00 a.m. for early arrival at the airport before our 7:00 a.m. departure. About two-and-a-half hours sleep, I estimate. My “food bag” stuffed to the brim, I forage for the container of sliced bananas and strawberries to go with my complimentary hot tea. Jack’s blood sugar soars sky-high along with the plane, so he skips the morning meal, sips black coffee instead. We both gaze glassy-eyed out the plane window through much of the flawless flight to Dallas. Transfer to a smaller plane for the last hop into Queretaro means a choppier ascent and descent, but compensation comes when boarding, deplaning, and customs take a fraction of the time as in the huge stateside airports we’ve just left. Munching on a homemade turkey wrap and raw broccoli from my stash, I pass the two-plus hours reading “A Year in Provence,” by Peter Mayle, chuckling over his witty and affectionate observations on life in a foreign environment. Could this be a good omen for what lies in store for us? Mini-panic as the flight attendant passes out a brochure on what one can and cannot carry into Mexico, and I learn that I will have to throw away all fresh fruit and meat items – most of what I brought along. I rush to gobble down one of the grapefruits, eye the second one, then decide against the foolishness of overeating, just to avoid throwing food into the trash bin. A second bout of panic as we travel in a hired van from the airport to San Miguel. I had long justified the radical notion of moving south of the border by telling myself, this will be such a scenic and appealing setting that everyone will want to visit us there. Now, as I pass mile after mile of graffiti-marred, ramshackle, deserted roadside buildings and rickety wooden sheds selling everything from tires to tacos, I can only think, oh…my…gosh; I could never ask friends and loved ones to endure this depressing scene. The automatic-weapon-yielding Federales, pulling over suspect vehicles as we travel the highway route into town, etch even more negatives into my first impression. Praying that the scene will brighten as we coil our way through carved out mountainsides and begin our final sloped entry into Wonderland, I wait for the long-anticipated breathtaking view of the baroque colonial city itself. From our elevated perspective I see a mass of buildings, crammed into a small area, punctuated by towering salmon-colored spires here and there. I squint to recreate the hazy scenes from the internet videos. I strain my neck to close in on the central town square and block out the surrounding third-world images. But the magical moment does not happen for me. My husband is less dismayed, more optimistic. Passing through a framework of decaying infrastructure which others might more charitably describe as historically correct, we find our way to our rental home, unlock the security gate, and gratefully envelop ourselves in the lush greenery of the courtyard. I am tired and hungry. A good night’s sleep might refresh my attitude. Utterly depleted, we stumble upon a little restaurant just around the corner from our lodgings, apparently carved – as so many establishments here are – into a block-long chunk of concrete and stone. Here my husband has two carne asada-style beef tacos and I tuck into a wonderful chili-soup of ground beef, “Jalisco style,” with condiments of raw chopped onion and parsley, and a small side salad of jicama and carrot sticks. We pay our 200 pesos and step back into the seclusion of our rented digs. Such a welcoming sight, the beautiful purple-pink of blooming…bougainvillea? Jacaranda? Not sure. But as we shut the gates on the narrow, uneven sidewalks and aging house fronts along this street, the blooms do much to sweeten the bitter taste of disappointment. We fall into bed around 8:30, are sawing logs by 9:00. Under tomorrow’s sunny skies, we will surely discover the hidden charms of this place they call The Heart of Mexico.